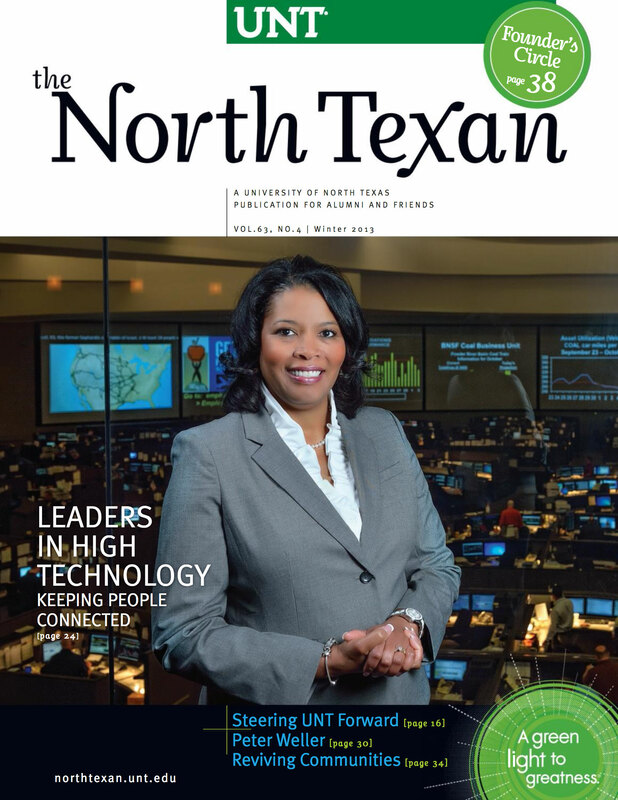 Alumni working at high-profile companies use their UNT foundation to stay a step ahead of ever-changing technological industries. Alumni restore economic viability of neighborhoods compromised by urban decay. President V. Lane Rawlins brought boldness, vision and discipline to UNT. A hobby turned into a career when actor/director Peter Weller stepped on stage at UNT. Members of the Class of 1963 reunited during Homecoming weekend. Mean Green football fans congratulate the team's players. UNT campus plays leading role in Homecoming 2013 with Hollywood theme. Group recognizes donors whose contributions have a deep and lasting impact. UNT honors faculty for their steadfast dedication to teaching and scholarship. When I became interim president in 2010, I didn't plan to stay longer than a year. Alumnus helps a young musician achieve her dream by making a special flute. How can you give an effective presentation? UNT alumnus Bob Huffaker recalls covering JFK assassination. The Eagle Feather turns 10, and UNT alums perform with Lyle Lovett. Former Mean Green football player Redaric Williams is now in The Young and The Restless cast. UNT alumnus Austin Heitzman brings a painter's eye to the art of designing one-of-a-kind furniture. UNT music students, professor edit the master work, Vespers of 1610. UNT alumnus Mike Howard recalls protecting President Johnson as Secret Service agent. UNT journalism students tell stories about life in Mexico. UNT supporter meets alumni who play for premier jazz ensemble of U.S. Air Force. Career musician Will Miller returns to finish his degree at UNT. Alumna designed uniforms for Dallas Cowboys Rhythm and Blue Dancers. UNT alum Andrew Nguyen creates non-profit powered by veterans. Basketball opens first season in Conference USA. UNT alumni Erin and JP Hossley use their art backgrounds to create eclectic Dallas boutique. A new agreement between the association and the university will provide more services. UNT alumnus Oscar Atumah helps establish an applied gerontology program for Nigerian universities.